I said two years ago that all the Republican Party had to do was “get behind the people’s choice (candidate Trump), support and promote him, and enjoy the glorious ride to the White House, and the rebirth of the Republican Party.” Prophetic, yes? Instead, the assclowns who enjoy a majority in both chambers of Congress obstructed candidate Trump then and obstruct President Trump today, denying his every initiative from border wall funding to repealing Obamacare, while waddling to every convenient mic they can find to disparage the leader of their party and President of the United States. Over half of the traveling freak show we call the United States Congress are members of the Republican Party. Like the entire Democrat Party, they are mostly swamp creatures of the first rank, garden variety parasites, feasting on their host, We the People, enjoying their comfy cruise on the gravy train, courtesy of the hard-working constituents they were sent to Washington to represent. So, with obstructionists in his own party, where does the president turn? The Democrats, of course! The Republicans did it to themselves. They didn’t shoot themselves in the foot. They shot themselves in the face. And now they are staring silently in bewilderment, wondering how the leader of their party could abandon them. Total dumbasses! That’s as kind as I can be. They had it made, a chance to make history, to become the most popular Congress in memory, to assure themselves of being incumbents for another decade, at least. Now, they will struggle to save their dying party. How will all of this shake out? Well, it could mean the end of Paul Rino’s speakership and Mitch McConnell’s Senate leadership. That is the best possible outcome for the Republican Party. And if those who replace them are not willing to pull their respective majorities together and advance the agenda of President Trump, which is also the agenda of We the People who elected him, then it will be more of the same, except the majorities in both chambers may very well shift to the Democrats next year and beyond. Furthermore, and even more importantly for the Republican Party, is the unavoidable fact that they may have very well turned this president against their party. The Republican Party needs Donald Trump far more than Donald Trump needs the Republican Party. I can envision a scenario where President Trump leaves the Republican Party. He is popular enough, notwithstanding the fake news mainstream media and lying pollsters, to run as an independent in 2020, or even as a Democrat…. and win! My opinion. The Democrats desperately need a candidate for 2020, and incumbent Trump can bring bazillions into their empty coffers. Long shot, but I would not be the least bit surprised to see it happen. The first scenario is the most likely, I believe. 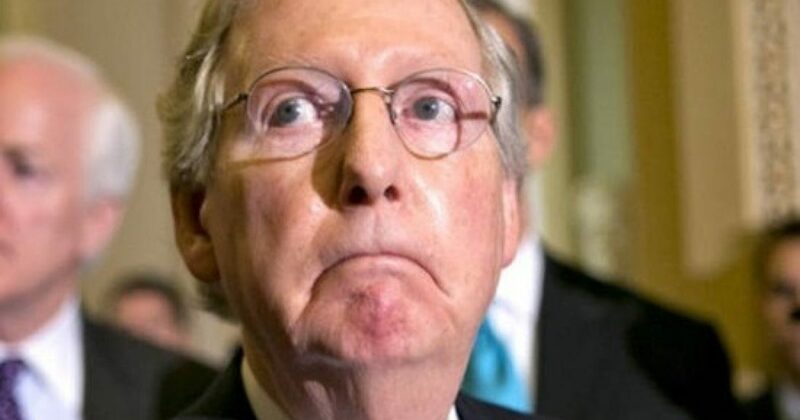 McConnell and Rino lose their leadership roles and are shipped to the land of political obscurity. Fellow Rino Jeff the Flake will be clobbered in next year’s primary against Kelli Ward, and fellow Arizona Rino, Songbird McCain, will likely disappear via the most natural attrition, being replaced with a LOYAL Republican by GOP Governor Doug Ducey, a popular conservative governor who won election in 2014 by 14 percentage points. His first term will end in early 2019. It is most likely that he will appoint a replacement for McCain before then. President Trump aims to drain the swamp, and he will do it with the help of any and all who will assist him, regardless of party affiliation. President Trump cuts a dirty little deal with Democrats and the swamp rats are surprised? They scurry for cover like cockroaches when the lights flick on.